Augustusburg Castle at Bruhl was the sumptuous residence of Clemens August von Wittelsbach (1700–1761), archbishop and prince-elector of Cologne . It was created in 1725 by the Westphalian architect Johann Conrad Schlaun and was transformed into a magnificent palace under the direction of the Bavarian court master builder François de Cuvilliés between 1728 and 1768. 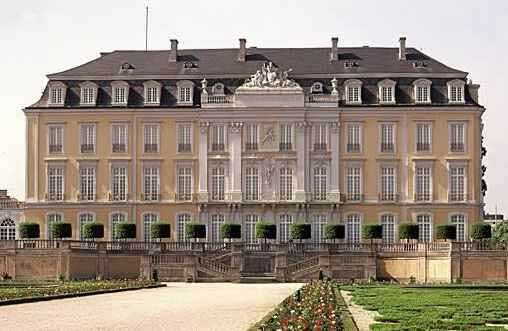 The famous staircase of the palace was designed by Balthasar Neumann and until 1996 used for official state occasions. Dominique Girard planned the baroque gardens in French style.